Subscribe to my blog - click here! Singapore Airlines's business class on the A380 was recently voted, again, as the best in the world. I can wholeheartedly agree! For example, when was the last time you saw a stewardess kneeling to store a guest's belonging beneath the seat? Or guiding a passenger to the next empty toilet? Singapore Airline's recipe is easy: combine excellent service by hyper-attentive staffs with spacious seats, mouth-watering food and mind-boggling entertainment choices (I loved the Ministry of Sound chill-out radio program on the Bose noise-reduction headset). Flying has never been better! PS: The super-size A380 actually feels no different to normal-sized planes, only that it is quieter. Picture: Service beyond comparison, Singapore Airlines Business Class. 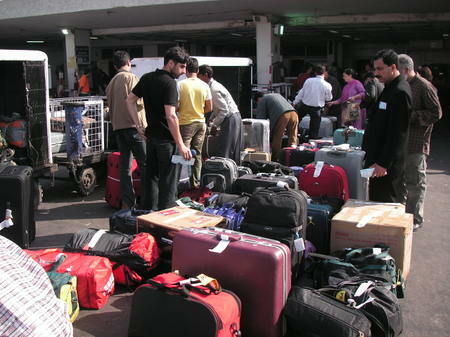 Picture: Let's play "find your baggage" at Delhi airport. Why do you want to travel (not just go on holiday, mind you)? What makes you think that the trip was worthwhile? I recently read a book called “The Art of Travel” by the modern-day philosopher Alain de Botton in which he exactly tackles those questions. To answer the question he draws upon the 19th century English artist John Ruskin who laid strong focus on interacting with the scenery either through drawing or through writing (“paint with words”). Ruskin urged us to interact with beauty as just briefly glancing over a beautiful scenery does not help to really appreciate its beauty. Actively contemplating beauty, according to Ruskin, allows us to understand why something is beautiful. And probably to your dismay he counted photography as not among the activities that allows us to understand beauty as it is too quickly done. Therefore my fellow travellers, don your pencils, get your crayons ready or start your own blog in order to appreciate the beauty of our home called earth. Go out and gain insights for life (according to Friedrich Nietzsche). Picture: The newly refurbished New Majestic Hotel in Singapore can also be found on the websites below. Quang-Tuan Long has collected over 13'000 pictures from all around our beautiful world. It has never been truer: a picture says more than a thousand words! Indulge here. Americans are sometimes accused of traveling little and just caring about their own country or state. According to a recent stat former President Clinton traveled the most with 30 days abroad. And there are over one million American GIs on almost 600 bases Americas has over the world. They also travel. And there are the former teacher Tim with his wife, a geologist, Cindie from Arizona. 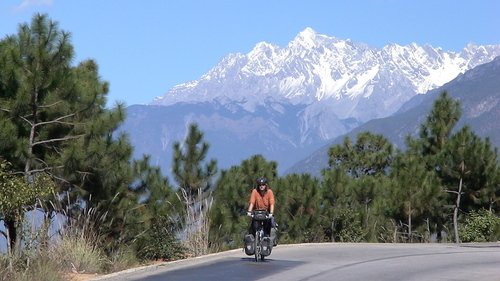 They left Arizona, USA, in March 2002 and have since traveled the world on their two bicycles. They peddled through Mexico, Central and South America and China. Next is Russia, Europe and if Tim can convince Cindie, Africa. We met them in our guesthouse and we spent the afternoon together. As most travelers we soon embarked on discussing costs and budget. They currently live on about 20$ a day and make their money by selling Google ads on their website www.downtheroad.org which gets over 3’000 unique users a day (and he taught me a few tricks about how to generate traffic on a website). Like this they more or less break even. They also sell their travel books online and make bit money out of that.